Israeli aircraft bombed a Hamas militant base in the Gaza Strip for the first time since the end of a war in the territory, in response to a rocket that militants launched earlier in the day, the army said. 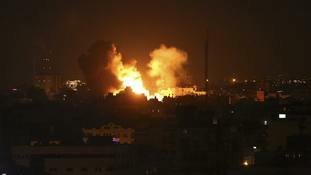 The bombs struck in the Khan Younis area in the southern Gaza Strip. Local hospital officials said there were no casualties. The militant rocket fired earlier landed in a field in southern Israel and no one was injured. Prime Minister Benjamin Netanyahu has said that PLO President Mahmoud Abbas "still has time" to reverse course on the unity pact with Hamas if it wants to continue peace talks with Israel. A spokesman for the Palestinian Islamist Hamas movement said "our people" feel "extreme happiness" at the death of Ariel Sharon, who he described as a "tyrant" and "criminal". Hamas spokesman Sami Abu Zuhri said the former Israeli Prime Minister's "hands were smeared with the blood of our people and the blood of our leaders here and in exile". Nearly 1,000 tunnels used to link Gaza with Egypt, but most have been closed or destroyed by Egypt's military, which fears Hamas-supported militants are using them to carry out attacks. Hamas said it welcomed the resignation of that Palestinian Prime Minister Salam Fayyad. The acceptance of Salam Fayyad resignation has nothing to do with the unity agreement but it is related to the conflict between Fatah and Salam Fayyad and that was explained during the latest revolutionary committee meeting for Fatah movement where there was a demand for the dismissal of Salam Fayyad because of the conflict between the two sides. Regarding to the unity agreement it is in the hands of Fatah movement whenever it is ready to fulfil the agreement totally and stop picking what it wants. Salam Fayyad has gone from the government after he left our nation with a lot of debt. Exiled Hamas leader Khaled Mashaal broke into tears as he arrived in the Gaza Strip for his first-ever visit. "I am back in Gaza because it never left my heart. I have been dreaming of this historic moment my entire life, to come to Gaza. I ask God to give me martyrdom one day on this land."